Key leaders involved in the Jan. 9-16, 2004, Middle East visit met together in Jerusalem Jan. 10. 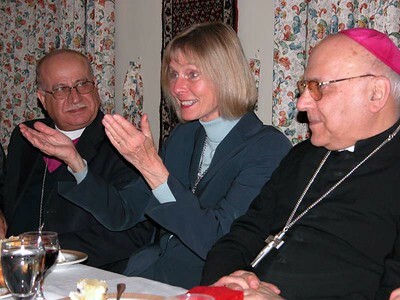 They are, from left, U.S. Rep. Lois Capps (D-Calif.); Bishop Munib Younan, Evangelical Lutheran Church in Jordan (and Palestine); Bishop Dean Nelson, ELCA Southwest California Synod; and Bishop Murray Finck, ELCA Pacifica Synod. 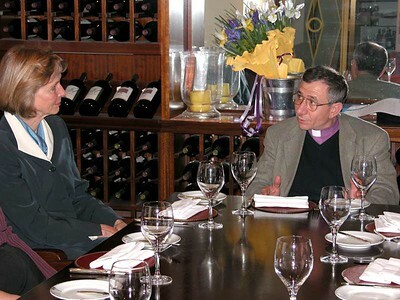 At dinner in Jerusalem Jan. 10, Bishop Munib Younan of the Evangelical Lutheran Church in Jordan (and Palestine), right, briefed U.S. Rep. Lois Capps, left, and other members of the ELCA delegation as they began their five-day visit to Israel and the West Bank. While on a five-day trip to Israel and the Palestinian territories, California Congresswoman Lois Capps -- an ELCA member-- expressed thanks for encouragement and hope for peace in the Middle East from Jerusalem Christian leaders. With Capps are, left, His Grace Rev. 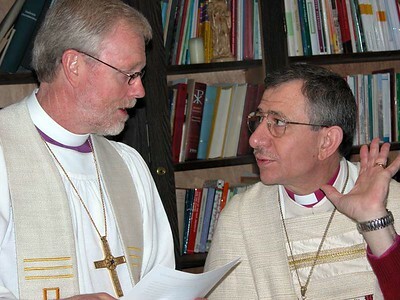 Riah Abu-Al-Asal, bishop of the Episcopal Diocese of Jerusalem and the Middle East, and right, His Beatitude Patriarch Michel Sabbah, Patriarch of the Latin Catholic Church in Jerusalem. 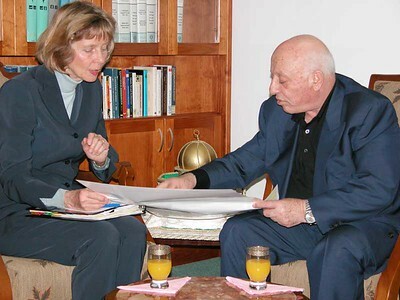 Bishop Murray Finck, ELCA Pacifica Synod, left, and Bishop Munib Younan, Evangelical Lutheran Church in Jordan (and Palestine), discuss arrangements for a joint service of worship of the English and Arabic language congregations at the Lutheran Church of the Redeemer in Jerusalem's Old City. Finck was part of informational trip to the Middle East Jan. 9-16 organized by the Lutheran Office for Governmental Affairs. 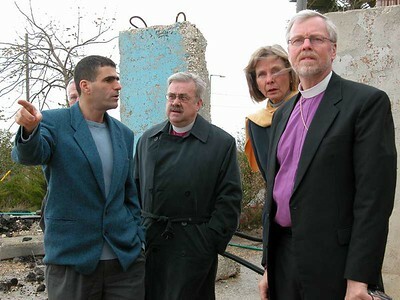 From left, former Member of the Israeli Knesset Mossi Raz, accompanies Bishop Dean Nelson, ELCA Southwest California Synod, U.S. Rep. Lois Capps (D-Calif.) and Bishop Murray Finck, ELCA Pacifica Synod, on a Jan. 12 visit to Israeli settlements and illegal outposts in the West Bank. Capps and the bishops visited the Middle East on a fact-finding trip Jan. 9-16. 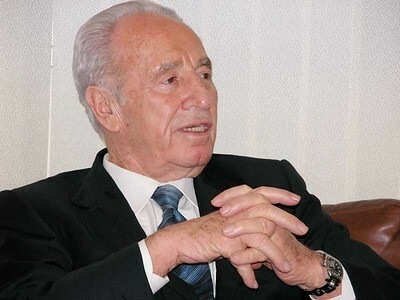 Shimon Peres, chairman of the Israeli Labor Party, met Jan. 13 with U.S. Rep. Lois Capps (D-Calif.) and ELCA Bishops Murray Finck and Dean Nelson at the Labor Party Headquarters in Tel Aviv. Palestinian Prime Minister Ahmed Qureia, right, met with U.S. Rep. Lois Capps (D-Calif.) and other members of the ELCA delegation Jan. 15. 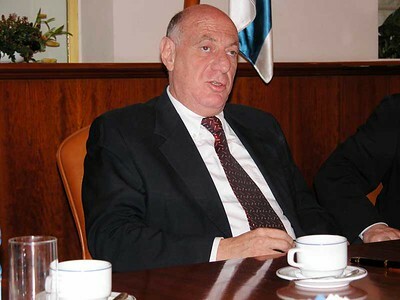 Dov Weisglas, chief of staff for Israeli Prime Minister Ariel Sharon, met Jan. 12 with U.S. Rep. Lois Capps (D-Calif.) and Bishops Dean Nelson and Murray Finck at the prime minister's office in Jerusalem. The ELCA delegation visited the Israeli "separation" or "security" wall. This section runs through the village of Abu Dis near Jerusalem. 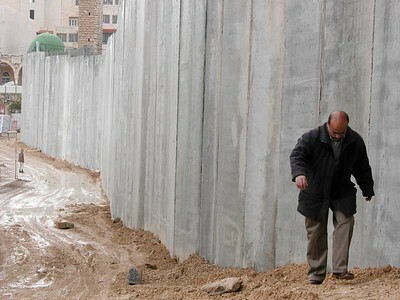 The ELCA bishops in the delegation say the wall will only heighten tensions between Israelis and Palestinians. 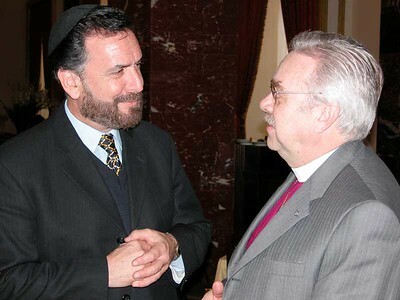 Bishop Dean Nelson, right, ELCA Southwest California Synod, and Rabbi David Rosen participated in a dialogue involving representatives of Rabbis for Human Rights and the ELCA delegation. The meeting took place in Jerusalem. 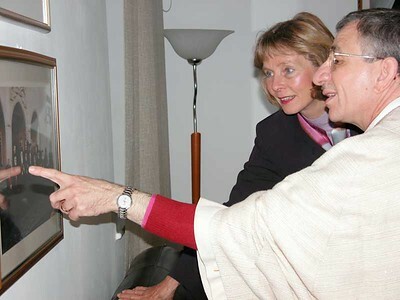 Bishop Munib Younan, right, Evangelical Lutheran Church in Jordan (and Palestine) (ELCJ), and U.S. Rep. Lois Capps (D-Calif.) examine a photo in the of Middle East heads of churches.